The invention relates to a method and a device for adjusting the temperature of a mobile phone. The method for adjusting the temperature of the mobile phone comprises the following steps: when a temperature acquisition condition is triggered, acquiring a current environmental temperature of the mobile phone; determining a temperature control strategy corresponding to the current environmental temperature according to corresponding relationships between the current environmental temperature and the temperature control strategy as well as between a pre-stored environmental temperature and the temperature control strategy; and adjusting the temperature of the mobile phone according to the determined temperature control strategy. Through the embodiment of the invention, discomfort of a user due to overheat of the surface of the mobile phone can be avoided. Meanwhile, a highest running speed can be provided, so that the user can better use the mobile phone in different environments, and the use experience of the user is improved greatly. 本公开涉及通信技术领域，尤其涉及一种手机温度的调整方法及装置。  The present disclosure relates to apparatus and a method for adjusting the field of communications technology, particularly to a temperature of the mobile phone. 随着移动终端技术的快速发展，各种移动终端例如手机已非常普及，并且，功能日益增多。  With the rapid development of mobile terminal technology, various mobile terminals such as mobile phones have been very popular, and the function is increasing. 随着手机功能的增多，人们使用手机的时间也越来越长，容易导致手机温度过高， 手机温度越高，辐射越大，这必然会影响人们的身体健康，另外，温度过高还可能发生爆炸。 With the increase in mobile phone functions, people use mobile phones more and more long time, easily lead to overheating mobile phones, mobile phone higher temperature, the greater the radiation, which is bound to affect people's health, in addition, the temperature is too high may also explosion occurs. 目前，为了保证用户使用手机时有良好体验，手机厂商都会针对手机做温度控制。  Currently, in order to ensure a good user experience when using mobile phones, mobile phone manufacturers will do for mobile temperature control. 但是，现在的手机均使用一套固定的温度控制方式，这种方式虽然可以保证在极限条件下可以使用手机，但当手机处于非极限条件时会大大降低手机的运行速度。 However, mobile phones are now using a fixed set of temperature control, can greatly reduce the phone's running speed Although this method ensures that the phone can be used under extreme conditions, but when the phone is in non-extreme conditions. 由此可见，目前的温度控制方式难以适应不同的环境需求。  Thus, the present temperature control is difficult to adapt to different environments. 本公开实施例提供一种手机温度的调整方法及装置，用以解决目前的温度控制方式难以适应不同的环境需求的问题。  The present embodiment provides a disclosure problem phone temperature adjusting method and apparatus for solving the current temperature control difficult to adapt to the different environmental needs. 根据确定的温度控制策略调整所述手机的温度。  The determination of the temperature control to adjust the temperature of a mobile phone policy. 获取所述手机的当前位置和移动前的位置，若二者之间的距离大于预设距离，则所述温度获取条件被触发。  acquiring the position before the current position of the mobile handset and, if the distance between the two greater than a preset distance, said temperature condition is triggered acquisition. 从天气服务器提供的天气应用程序编程API接口获取所述当前环境温度。  from a weather server providing the weather application programming API interface to obtain the current ambient temperature. 在一实施例中，所述环境温度与温度控制策略的对应关系保存在所述手机的固件包ROM中。  In one embodiment, the ambient temperature and temperature control strategy stored in the correspondence relationship firmware package phone ROM. 从所述手机的服务器获取并保存所述环境温度与温度控制策略的对应关系。  obtaining and saving the ambient temperature and the temperature control correspondence relationship policy server from the phone. 在一实施例中，所述提示信息中包含所述环境温度与温度控制策略的对应关系的下载入口。  In one embodiment, the presentation information contained in the ambient temperature and the temperature control of a correspondence relationship strategy download portal. 根据确定的温度控制策略控制运行的应用程序数量，以调整所述手机的温度。  The determined number of temperature control strategy running applications, to adjust the temperature of the cell phone. 控制模块，被配置为根据所述确定模块确定的温度控制策略调整所述手机的温度。  The control module configured according to the determining module determines temperature control to adjust the temperature of a mobile phone policy. 第二触发子模块，被配置为获取所述手机的当前位置和移动前的位置，若二者之间的距离大于预设距离，则所述温度获取条件被触发。  The second trigger sub-module, configured to acquire the current position and the position before the movement of the phone, if the distance between the two greater than a preset distance, said temperature condition is triggered acquisition. 第二获取子模块，被配置为从天气服务器提供的天气应用程序编程API接口获取所述当前环境温度。  The second obtaining sub-module, configured to provide a weather application programming API interface to obtain from a weather server the current ambient temperature. 对应关系获取模块，被配置为从所述手机的服务器获取并保存所述环境温度与温度控制策略的对应关系。  The correspondence relation acquisition module configured to acquire from the server and saves the phone ambient temperature and the temperature control strategy correspondence. 第二控制子模块，被配置为根据确定的温度控制策略控制运行的应用程序数量， 以调整所述手机的温度。  The second control sub-module, configured to control the number of policy control according to an application running on the determined temperature to adjust the temperature of the cell phone. 本公开的实施例提供的技术方案可以包括以下有益效果：由于环境温度与温度控制策略的对应关系中保存了不同环境温度下不同的温度控制策略，所以可以根据不同的当前环境温度匹配到对应的温度控制策略，从而可以根据对应的温度控制策略调整手机的温度，这种根据当前环境温度动态调整手机温度的方式不仅可以避免手机表面过热给用户带来不适感，同时可以提供尽可能大的运行速度，从而使用户可以更好地在不同的环境下使用手机，大大提升用户的使用体验。  The present embodiment provides a technical solution disclosed may comprise the following advantageous effects: the ambient temperature and temperature control correspondence relationship strategy stored under different environments of different temperature control strategies can be based on different ambient temperatures match the current corresponding to a temperature control strategy, which can control the temperature of the phone to adjust the strategy according to the corresponding temperature, hot surfaces, which can not only avoid the phone to the user discomfort dynamically adjust based on the current temperature of the ambient temperature mode mobile phone, and can provide as much as possible great speed, allowing users to make better use of mobile phones in different environments, greatly enhance the user experience. 图1是根据一示例性实施例示出的一种手机温度的调整方法的流程图。  FIG. 1 is a flowchart illustrating an embodiment of a temperature adjusting cell phone according to an exemplary embodiment. 图2是根据一示例性实施例示出的一种手机温度的调整方法的场景图。  FIG. 2 is a scene graph illustrating a method of adjusting the temperature of a mobile phone according to an exemplary embodiment. 图3是根据一示例性实施例示出的另一种手机温度的调整方法的流程图。  FIG. 3 is a flowchart of another method for adjusting the temperature of the mobile phone illustrated in accordance with an exemplary embodiment. 图4是根据一示例性实施例示出的另一种手机温度的调整方法的场景图。  FIG. 4 is another scenario illustrating a method of adjusting the temperature of the mobile phone illustrated in accordance with an exemplary embodiment. 图5是根据一示例性实施例示出的一种手机温度的调整装置的框图。  FIG. 5 is a block diagram illustrating an embodiment of adjusting means the temperature of a mobile phone according to an exemplary embodiment. 图6a是根据一示例性实施例示出的另一种手机温度的调整装置的框图。  Figure 6a is a block diagram of another adjusting device illustrating a mobile phone according to the temperature of an exemplary embodiment. 图6b是根据一示例性实施例示出的另一种手机温度的调整装置的框图。  Figure 6b is a block diagram of another adjusting device illustrating a mobile phone according to the temperature of an exemplary embodiment. 图7是根据一示例性实施例示出的又一种手机温度的调整装置的框图。  FIG. 7 is a block diagram of yet another mobile phone temperature adjustment device shown in accordance with an exemplary embodiment. 图8是根据一示例性实施例示出的再一种手机温度的调整装置的框图。  FIG. 8 is a block diagram of yet another means of adjusting the temperature of the mobile phone illustrated in accordance with an exemplary embodiment. 图9是根据一示例性实施例示出的一种适用于手机温度的调整装置的框图。  FIG. 9 is a block diagram illustrating an apparatus suitable for adjusting the temperature of the mobile phone according to an exemplary embodiment. 在步骤S101中，当温度获取条件被触发时，获取手机的当前环境温度。  In step S101, when obtaining the temperature condition is triggered, the mobile phone acquires the current ambient temperature. 在该实施例中，手机中可以保存预先设置的用于触发获取环境温度的时间信息， 例如每天上午9点，这样，每当时间达到上午9点即温度获取条件被触发，手机就开始获取当前环境温度，也可以保存用于触发获取环境温度的时间间隔，例如6小时，这样，每当当前时间与上次获取环境温度的时间间隔达到6小时，手机就开始获取当前环境温度。  In this embodiment, the phone can be stored for a preset time information acquisition trigger ambient temperature, for example from 9:00 am, so that whenever time reaches 9:00 i.e. temperature acquiring condition is triggered, the phone began to get the current temperature, you can save time get used to trigger the ambient temperature intervals, such as 6 hours, so that whenever the current time and the last time access to environmental temperature interval of 6 hours, the phone began to get the current ambient temperature. 另外，手机中还可保存触发获取环境温度的距离信息，例如当手机的移动距离大于预设距离例如300公里，即温度获取条件被触发，就开始获取当前环境温度。  Further, the mobile phone may also be stored trigger information acquired from the ambient temperature, for example, when the mobile phone is greater than a preset distance, for example 300 km distance, i.e. the temperature condition is triggered acquisition, it starts retrieving the current ambient temperature. 在该实施例中，可以利用手机的全球定位系统（GPS)获取手机的当前位置，并从保存的信息中读取移动前的位置，若二者之间的距离大于预设距离例如300公里，则表明温度获取条件被触发，因此可以获取当前环境温度。  In this embodiment, the phone may use a global positioning system (GPS) to get the current location of the handset, and the reading position before the movement from the stored information, if the distance between the two greater than a preset distance e.g. 300 kilometers, it indicates that the temperature acquisition condition is triggered, it can get the current ambient temperature. 另外，为了方便后续计算距离信息，在获取手机的当前位置后，也要保存该当前位置。 Further, the distance information in order to facilitate subsequent calculations, after obtaining the current location of the handset, but also save the current position. 上述预设距离可以根据需要灵活设置，300公里仅为示例。  The predetermined distance may be flexibly set, 300 km is merely exemplary. 方式一：通过手机内置的天气应用程序（APP)获取当前环境温度。  One way: Get the current ambient temperature through the phone's built-in weather application (APP). 方式二：从天气服务器提供的天气应用程序编程（API)接口获取当前环境温度。  Second way: weather application program provided from the weather server (API) interface to obtain the current ambient temperature. 其中，方式一中的APP也可以从气象局等的天气服务器提供的天气API接口获取当前环境温度。  wherein, in an embodiment may also be provided from APP Meteorology weather weather server API interface to obtain the current ambient temperature. 在步骤S102中，根据当前环境温度和预存的环境温度与温度控制策略的对应关系，确定与当前环境温度对应的温度控制策略。  In step S102, according to the current ambient temperature and the ambient temperature and the prestored correspondence relationship between a temperature control strategy, and determining the current ambient temperature corresponding to the temperature control strategy. 在该实施例中，手机中保存有环境温度与温度控制策略的对应关系，如表1所示， 该对应关系可以保存在手机的固件包（ROM)中。  In this embodiment, the mobile phone is stored in the ambient temperature and temperature control strategy correspondence relationship, as shown in Table 1, the correspondence relationship may be stored in the phone firmware package (ROM) in. 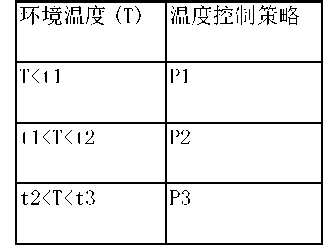 其中，tl〈t2〈t3。  wherein, tl <t2 <t3. 若当前环境温度小于tl，则根据表1可以确定与当前环境温度对应的温度控制策略为P1，若当前环境温度介于tl和t2之间，则可以确定与当前环境温度对应的温度控制策略为P2,若当前环境温度介于t2和t3之间，则可以确定与当前环境温度对应的温度控制策略为P3。  If the current ambient temperature is less than tl, the table 1 may be determined according to the current ambient temperature corresponding to the temperature control strategy is P1, if the current ambient temperature is between tl and t2, it may be determined corresponding to the current ambient temperature control strategy P2, if the current ambient temperature is between t2 and t3, it may be determined corresponding to the current ambient temperature of the temperature control policy P3. 在该实施例中，假设tl为零下10度，t2为零度，则若当前环境温度为零下20度时，P1可以为：允许CPU工作温度超过80度，不对频率和核数进行限制，若当前温度为零下8度时，P2可以为：CPU的工作温度限制在70度，不对频率和核数进行限制。  In this embodiment, it is assumed tl minus 10 degrees, t2 is zero, then if the current ambient temperature of minus 20 degrees, Pl may include: limiting permits the CPU to temperatures in excess of 80 degrees, right frequency and audit If the current temperature is minus 8 degrees, P2 may be: limiting CPU operating temperature is limited to 70 degrees, and the frequency does not audit. 之所以这样设置，是因为当环境温度比较低时，手机散热较快，所以CUP的工作温度可以高些。  The reason for this setting, because when the ambient temperature is relatively low, the phone faster heat dissipation, so CUP operating temperature can be higher. 需要说明的是，上述表1、Pl、P2仅为示例，在实际应用中可根据需要设置温度区间和对应的温度控制策略。  Incidentally, in Table 1, Pl, P2 merely exemplary, in the practical application control policy may be provided as necessary temperature interval and corresponding temperature. 例如，温度控制策略还可以为允许运行的APP数量等。 For example, temperature control strategy may also be allowed to run a number of APP and the like. 另外，环境温度与温度控制策略的对应关系也可以保存在手机的服务器上，这样， 当手机用户需要时，可以从服务器下载该环境温度与温度控制策略的对应关系，从而减少ROM所占空间。  Further, the ambient temperature corresponding relationship between the temperature control strategy may be stored on the phone server, such that when mobile phone users need to download the ambient temperature corresponding relationship between the temperature control strategy from the server, thereby reducing the ROM. space. 在步骤S103中，根据确定的温度控制策略调整手机的温度。  In step S103, according to the determined temperature control strategy adjustment phone. 在该实施例中，在确定好温度控制策略后，可以根据该温度控制策略控制CPU工作，以调整手机的温度，也可以根据温度控制策略控制运行的APP数量，以调整手机的温度。  In this embodiment, after determining good temperature control strategy can be controlled based on the temperature of the policy control CPU is operating, in order to adjust the temperature of the phone, the number of APP policy control operation may be controlled according to the temperature to adjust the temperature of the mobile phone . 例如，若当前确定好的控制策略为P1，则可以按照P1的内容控制CPU工作，由于P1不对CPU的频率和核数进行限制，且允许的工作温度超过80度，因此，CPU的运行速度很尚。  For example, if the currently-determined control strategy P1, P1 can be controlled according to the contents of the CPU is operating, since the frequency P1 and not to limit the number of CPU cores, and allowing the temperature exceeds 80 degrees, therefore, the CPU runs yet. 又例如，若当前确定好的控制策略为P2,则可以按照P2的内容控制CPU工作，由于P2不对CPU的频率和核数进行限制，且允许的工作温度限制在70度，因此，CPU的运行速度较高，但低于P1控制的CPU的运行速度。  As another example, if the currently-determined control strategy P2, the CPU may be controlled according to the contents of work and P2, since the frequency and the number of nuclear P2 CPU is not a limitation, and the allowable operating temperature is limited to 70 degrees, and therefore, the high speed CPU, but lower than P1 CPU speed control. 由此可见，根据不同的温度控制策略控制CPU工作可以控制手机的表面温度不至于太高，同时可以提供尽可能大的运行速度，提高用户的使用体验。  Thus, the CPU control strategy can work to control the phone's surface temperature will not be too high, and can provide the greatest possible speed, to improve the user experience depending on the temperature. 下面结合图2对本公开进行示例性说明，如图2所示，用户在使用手机21时，由于该手机21设置了每天上午9点获取当前环境温度，因此，每天上午9点手机21可以从天气服务器22提供的天气API接口获取当前环境温度，假设当前环境温度为20度，则根据当前环境温度和预存的环境温度与温度控制策略的对应关系可以确定与当前环境温度对应的温度控制策略为P4,然后根据确定的温度控制策略P4控制CPU工作，以调整手机的温度， 假设此时CPU的运行频率为H，手机的运行速度为VI ;又假设获取到的当前环境温度为30 度，则根据当前环境温度和预存的环境温度与温度控制策略的对应关系可以确定与当前环境温度对应的温度控制策略为P5,然后根据确定的温度控制策略P5控制CPU工作，以调整手机的温度，假设此时CPU的运行频率为f2,手机的运行速度为V2,则fl大于f2, VI大于V  below with reference to FIG. 2 for illustrative of the present disclosure, as shown, when the user uses the mobile phone 21, since the handset 21 is provided from 9:00 am to get the current ambient temperature, and therefore, from 9:00 am phone 21 in FIG. 2 can interface to obtain the current ambient temperature from the Weather API weather server 22 provides, assuming that the current ambient temperature is 20 degrees, then the control correspondence relationship policy may determine the current temperature corresponding to the temperature control based on the current ambient temperature and stored ambient temperature and the temperature P4 strategy, then the control strategy based on the determined temperature control of the CPU P4 work, the phone to adjust the temperature, assuming that the operating frequency of the CPU is H, running at the phone Vl; and assume the acquired current ambient temperature of 30 degrees , it is possible to determine the ambient temperature corresponds to the current temperature control strategy based on correspondence between the current ambient temperature and stored in ambient temperature and temperature control strategy for the P5, then control strategy P5 control CPU work to adjust the temperature of your phone according to the determined temperature, assuming that the CPU operating frequency is f2, mobile phones running speed is V2, fl is greater than f2, Vl greater than V 2。 2. 而采用现有的固定的温度控制方式，H等于f2, VI等于V2,即为了避免极限条件下的手机表面温度过热，而降低CPU的运行性能，从而使得非极限条件下的CPU运行性能降低， 进而降低了手机的运行速度。 The use of conventional fixed control temperature, H is equal to f2, VI equals V2, i.e., a mobile phone in order to avoid surface overheating temperature under extreme conditions, and reduce the operating performance of the CPU, so that the operation performance of CPU in non-extreme conditions of reduced, thus reducing the phone runs. 由此可见，动态调整手机温度的方式不仅可以调整手机温度， 以避免手机表面过热给用户带来不适感，同时可以提供尽可能大的运行速度，大大提升用户的使用体验。 Thus, dynamic adjustment of the temperature of the phone the way not only can adjust the phone temperature to avoid overheating of the surface of the phone to the user discomfort, and can provide the greatest possible speed, greatly enhance the user experience. 上述手机温度的调整方法实施例，由于环境温度与温度控制策略的对应关系中保存了不同环境温度下不同的温度控制策略，所以可以根据不同的当前环境温度匹配到对应的温度控制策略，从而可以根据对应的温度控制策略调整手机的温度，这种根据当前环境温度动态调整手机温度的方式不仅可以避免手机表面过热给用户带来不适感，同时可以提供尽可能大的运行速度，从而使用户可以更好地在不同的环境下使用手机，大大提升用户的使用体验。 Example  The method for adjusting said handset temperature, the ambient temperature and temperature control correspondence relationship strategy stored in a different temperature control strategies at different ambient temperatures, can be matched to a corresponding temperature control strategy depending on the current ambient temperature , which can adjust the temperature control strategy according to the temperature corresponding to the mobile phone, this phone not only to avoid overheating of the surface of discomfort to the user based on the current dynamic adjustment of the temperature of the ambient temperature mode mobile phone, and can provide the greatest possible speed, so so that users can better use the phone in different environments, greatly enhance the user experience. 在步骤S300中，显示提示信息，以提示用户通过下载环境温度与温度控制策略的对应关系来调整手机温度。  In step S300, it displays a message to prompt the user to adjust the temperature controlled mobile phone policy by downloading the corresponding relationship with ambient temperature. 在该实施例中，当用户首次开启手机时，手机可以显示提示信息，以提示用户可以通过下载环境温度与温度控制策略的对应关系来调整手机温度。  In this embodiment, when a user first open the phone, the phone can display a message to prompt the user to adjust the temperature can be controlled phone policy by downloading the corresponding relationship between the ambient temperature and temperature. 另外，该提示信息中可以包含该对应关系的下载入口，以方便用户通过点击该下载入口下载环境温度与温度控制策略的对应关系，从而避免自己搜索下载入口的麻烦。  In addition, the message can be included in the correspondence between the download portal, to facilitate the user to download by clicking on the download portal ambient temperature and the temperature correspondence control policies, so as to avoid trouble downloading your own search portal. 在步骤S301中，从手机的服务器获取并保存环境温度与温度控制策略的对应关系。  In step S301, the acquisition and preservation of the environment temperature and the temperature control of the correspondence between the policy server from the phone. 根据下载入口从手机的服务器获取环境温度与温度控制策略的对应关系，并保存该对应关系。  access to environmental temperature and temperature control correspondence between the policy and save the correspondence between the mobile phone from a server based on the download portal. 在步骤S302中，获取手机的当前位置和移动前的位置，若二者之间的距离大于预设距离，则从内置的天气应用程序获取当前环境温度。  In step S302, the mobile phone acquires the current position and the position before the movement, if the distance between the two greater than a preset distance from the built-in weather application to get the current ambient temperature. 在该实施例中，假设预设距离为100公里，若计算出手机的当前位置和移动前的位置之间的距离即手机的移动距离为150公里，则需要从内置的天气APP获取当前环境温度，以动态调整温度控制策略。  In this embodiment, the predetermined distance of 100 km is assumed, when the distance between the calculated position of the phone before the current position and a movement distance which the mobile phone is 150 km, the need to obtain from the built-in weather APP the current ambient temperature to dynamically adjust the temperature control strategy. 在步骤S303中，根据当前环境温度和保存的环境温度与温度控制策略的对应关系，确定与当前环境温度对应的温度控制策略。  In step S303, based on the correspondence stored in the current ambient temperature and the ambient temperature and temperature control strategy to determine the current temperature corresponding to the ambient temperature control strategy. 在步骤S304中，根据确定的温度控制策略控制中央处理单元CPU工作，以调整手机的温度。  In step S304, the temperature control strategy based on the determined central processing unit CPU controls the work to adjust the temperature of the phone. 下面结合图4对本公开进行示例性说明，如图4所示，当用户首次开启手机41时， 手机41可以显示提示信息，该提示信息可以为"您可以通过下载环境温度与温度控制策略的对应关系来调整手机温度，请确认是否下载"，若用户点击"确认"键，则进一步显示环境温度与温度控制策略的对应关系的下载入口，用户通过点击该下载入口即可从手机41的服务器42下载环境温度与温度控制策略的对应关系。  below with reference to FIG. 4 for illustrative of the present disclosure, shown in Figure 4, when a user first opens the mobile phone 41, mobile phone 41 may display a message, the message may be "You can download the ambient temperature and temperature control to adjust the temperature corresponding relationship strategies phone, make sure to download ", if the user clicks the" OK "button, the download portal further shows correspondence between ambient temperature and the temperature control strategy, the user can click on the download portal from phone 41 42 downloads correspondence between ambient temperature and the temperature control strategy server. 然后，当温度获取条件被触发时，例如手机41的移动距离大于预设距离，则手机41可以通过内置的天气APP获取当前环境温度，若未获取到当前环境温度，则可以从气象局的天气服务器43提供的天气API接口获取当前环境温度，然后根据当前环境温度和下载的环境温度与温度控制策略的对应关系，确定与当前环境温度对应的温度控制策略，并根据确定的温度控制策略控制CPU工作，从而使手机的表面温度不会过热。 Then, when the acquired temperature condition is triggered, for example, mobile phone 41 is greater than a predetermined distance from, the mobile phone 41 can obtain the current ambient temperature of APP by the built-in weather, current ambient temperature if not acquired, it may be the weather from the weather bureau server 43 provides a weather API interface to obtain the current ambient temperature, then the control correspondence relations strategies according to the ambient temperature and the temperature of the current ambient temperature and downloaded to determine the current ambient temperature corresponds to the temperature control strategy and control policy control CPU according to the determined temperature work, so that the surface temperature of the phone without overheating. 上述手机温度的调整方法实施例，通过从服务器下载环境温度与温度控制策略的对应关系，而不是将该对应关系保存在ROM中，减少了ROM所占空间。 Example  The method of adjusting the temperature of said handset, by downloading from the server ambient temperature and the temperature control strategy correspondence relationship, rather than the corresponding relationship stored in the ROM, the ROM is reduced footprint. 与前述手机温度的调整方法实施例相对应，本公开还提供了手机温度的调整装置实施例。  Example of method for adjusting the temperature corresponding to the mobile phone, the present disclosure further provides a temperature adjustment apparatus embodiment of the phone. 图5是根据一示例性实施例示出的一种手机温度的调整装置的框图，如图5所示， 手机温度的调整装置包括触发获取模块51、确定模块52和控制模块53。  FIG. 5 is a block diagram illustrating a temperature adjusting means phone according to an exemplary embodiment, shown in FIG. 5, the temperature adjustment device comprises a trigger acquisition phone module 51, a determining module 52 and a control module 53. 触发获取模块51，被配置为当温度获取条件被触发时，获取手机的当前环境温度。  Trigger obtaining module 51, configured to obtain the time when the temperature condition is triggered, the mobile phone acquires the current ambient temperature. 确定模块52,被配置为根据触发获取模块51获取的当前环境温度和预存的环境温度与温度控制策略的对应关系，确定与当前环境温度对应的温度控制策略。  determining module 52, configured to trigger the acquisition module 51 according to the acquired current prestored correspondence relationship between ambient temperature and ambient temperature, and temperature control strategy to determine the current temperature corresponding to the ambient temperature control strategy. 控制模块53,被配置为根据确定模块52确定的温度控制策略调整手机的温度。  The control module 53 is configured to adjust the temperature of the phone control strategy determination module 52 determines the temperature. 在一实施例中，环境温度与温度控制策略的对应关系可保存在手机的ROM中。  In one embodiment, the correspondence relationship between ambient temperature and the temperature control strategy may be stored in the ROM of the mobile phone. 图6a是根据一示例性实施例示出的另一种手机温度的调整装置的框图，如图6a 所示，在上述图5所示实施例的基础上，触发获取模块51可包括：第一触发子模块511和第二触发子模块512。  Figure 6a is a block diagram illustrating another means of adjusting the temperature of the mobile phone according to an exemplary embodiment, as shown, on the basis of the above-described embodiment shown in FIG. 5, the obtaining module 51 is triggered 6a may comprise: a first trigger sub-module 511 and the second trigger sub-module 512. 第一触发子模块511，被配置为获取当前时间，若当前时间达到预设的温度获取时间，则温度获取条件被触发。  The first trigger sub-module 511, configured to obtain the current time, if the current time reaches the preset temperature acquisition time, the temperature condition is triggered acquisition. 第二触发子模块512,被配置为获取手机的当前位置和移动前的位置，若二者之间的距离大于预设距离，则温度获取条件被触发。  The second trigger sub-module 512, configured to obtain the location of the phone before the current position and movement, if the distance between the two greater than a preset distance, the temperature condition is triggered acquisition. 图6b是根据一示例性实施例示出的另一种手机温度的调整装置的框图，如图6b 所示，在上述图5所示实施例的基础上，触发获取模块51可包括：第一获取子模块513和第二获取子模块514。  6b is a block diagram showing a temperature adjustment device of FIG phone according to an exemplary embodiment illustrated another embodiment, as shown in Figure 6b, on the basis of the above-described embodiment shown in FIG. 5, the module 51 may trigger the obtaining comprises: obtaining a first and a second sub-module 513 obtaining sub-module 514. 第一获取子模块513,被配置为从内置的天气应用程序获取当前环境温度。  a first obtaining sub-module 513, configured to acquire the current ambient temperature from the built-in weather application. 第二获取子模块514,被配置为从天气服务器提供的天气应用程序编程API接口获取当前环境温度。  The second obtaining sub-module 514, configured to provide a weather application programming from a weather server API interface to obtain the current ambient temperature. 图7是根据一示例性实施例示出的又一种手机温度的调整装置的框图，如图7所示，在上述图5所示实施例的基础上，控制模块53可包括：第一控制子模块531或者第二控制子模块532。  FIG. 7 is a block diagram of yet another mobile phone temperature adjustment device shown in accordance with an exemplary embodiment, as shown in FIG. 7, on the basis of the above-described embodiment shown in FIG. 5, the control module 53 may include: a first a control sub-module 531 or the second control sub-module 532. 第一控制子模块531，被配置为根据确定的温度控制策略控制中央处理单元CPU 工作，以调整所述手机的温度。  The first control sub-module 531, configured to control the central processing unit CPU determines control strategy to work for the temperature to adjust the temperature of the cell phone. 第二控制子模块532,被配置为根据确定的温度控制策略控制运行的应用程序数量，以调整所述手机的温度。  The second control sub-module 532, configured to control the number of applications running in the control policy according to the determined temperatures, to adjust the temperature of the mobile phone. 如图5、图6a、图6b或图7所示的手机温度的调整装置调整手机温度的过程可参见图1所示实施例的对应部分，此处不赘述。  FIG. 5, FIG. 6a, adjust the temperature of the mobile phone handset process temperature control device shown in FIG. 7 or FIG. 6b may refer to the corresponding portion shown in FIG example of embodiment, not be repeated here 1. 上述手机温度的调整装置实施例，由于环境温度与温度控制策略的对应关系中保存了不同环境温度下不同的温度控制策略，所以可以根据不同的当前环境温度匹配到对应的温度控制策略，从而可以根据对应的温度控制策略调整手机的温度，这种根据当前环境温度动态调整手机温度的方式不仅可以避免手机表面过热给用户带来不适感，同时可以提供尽可能大的运行速度，从而使用户可以更好地在不同的环境下使用手机，大大提升用户的使用体验。  adjusting the handset temperature apparatus of this embodiment, since the ambient temperature and temperature control correspondence relationship strategy stored in a different temperature control strategies at different ambient temperatures, can be matched to a corresponding temperature control strategy depending on the current ambient temperature , which can adjust the temperature control strategy according to the temperature corresponding to the mobile phone, this phone not only to avoid overheating of the surface of discomfort to the user based on the current dynamic adjustment of the temperature of the ambient temperature mode mobile phone, and can provide the greatest possible speed, so so that users can better use the phone in different environments, greatly enhance the user experience. 显示模块54,被配置为在确定模块52根据当前环境温度和预存的环境温度与温度控制策略的对应关系之前，显示提示信息，以提示用户通过下载环境温度与温度控制策略的对应关系来调整手机温度。  The display module 54, configured before determining module 52 controls a correspondence relationship strategy according to the ambient temperature and the current temperature of the ambient temperature and the pre-stored, display a message to prompt the user through a correspondence relationship downloading ambient temperature and the temperature control strategy to adjust the temperature of the phone. 对应关系获取模块55,被配置为从手机的服务器获取并保存环境温度与温度控制策略的对应关系。  correspondence between the acquisition module 55 is configured to obtain from the phone's server and storage environment temperature and temperature control correspondence between the strategy. 另外，提示信息中还可包含环境温度与温度控制策略的对应关系的下载入口。  Further, the message may also include a correspondence relationship download inlet temperature and ambient temperature control strategy. 如图8所示的手机温度的调整装置调整手机温度的过程可参见图3所示实施例的对应部分，此处不赘述。  Mobile temperature control device shown in Figure 8 to adjust the temperature of the process can be found in the phone shown in Figure 3 corresponds to part of the embodiment are not repeated here. 关于上述实施例中的装置，其中各个模块、子模块执行操作的具体方式已经在有关该方法的实施例中进行了详细描述，此处将不做详细阐述说明。  For the above-described embodiment apparatus, wherein each module, sub-module specific embodiment perform operations have been described in detail in an embodiment relating to the method, and will not be here described in detail. 图9是根据一示例性实施例示出的一种适用于手机温度的调整装置的框图。  FIG. 9 is a block diagram illustrating an apparatus suitable for adjusting the temperature of the mobile phone according to an exemplary embodiment. 例如，装置900可以是移动电话，计算机，数字广播终端，消息收发设备，游戏控制台，平板设备，医疗设备，健身设备，个人数字助理，飞行器等。 For example, device 900 may be a mobile phone, a computer, a digital broadcast terminal, a messaging device, a game console, a tablet device, medical equipment, fitness equipment, personal digital assistant, aircraft and the like. 参照图9,装置900可以包括以下一个或多个组件：处理组件902,存储器904,电源组件906,多媒体组件908,音频组件910,输入/输出（I/O)的接口912,传感器组件914， 以及通信组件916。  Referring to Figure 9, device 900 may comprise one or more of the following components: a processing component 902, memory 904, power module 906, the multimedia component 908, audio components 910, input / output (I / O) interface 912, a sensor components 914, 916 and a communication component. 处理组件902通常控制装置900的整体操作，诸如与显示，电话呼叫，数据通信，相机操作和记录操作相关联的操作。 A data communication operation, camera operations and recording operations associated with  processing assembly 902 generally controls the overall operation of device 900, such as a display, a telephone call. 处理元件902可以包括一个或多个处理器920来执行指令，以完成上述的方法的全部或部分步骤。 Processing element 902 may include one or more processors 920 to execute instructions, to perform all or part of the steps of the method described above. 此外，处理组件902可以包括一个或多个模块， 便于处理组件902和其他组件之间的交互。 Moreover, processing component 902 may include one or more modules, facilitates the interaction between a component 902 and other components. 例如，处理部件902可以包括多媒体模块，以方便多媒体组件908和处理组件902之间的交互。 For example, processing component 902 may include a multimedia module 908 and the multimedia components to facilitate interaction between the processing component 902. 存储器904被配置为存储各种类型的数据以支持在设备900的操作。  The memory 904 is configured to store various types of data to support the operation of the device 900. 这些数据的示例包括用于在装置900上操作的任何应用程序或方法的指令，联系人数据，电话簿数据， 消息，图片，视频等。 These examples of the data include instructions or any application method on the device 900 for operation, contact data, phonebook data, messages, pictures, videos and the like. 存储器904可以由任何类型的易失性或非易失性存储设备或者它们的组合实现，如静态随机存取存储器（SRAM)，电可擦除可编程只读存储器（EEPR0M)，可擦除可编程只读存储器（EPROM)，可编程只读存储器（PR0M)，只读存储器（ROM)，磁存储器，快闪存储器，磁盘或光盘。 The memory 904 may be implemented by any type of volatile or non-volatile storage devices, or combinations thereof, such as static random access memory (SRAM), electrically erasable programmable read only memory (EEPR0M), an erasable programmable Read Only memory (EPROM), programmable read-only memory (PR0M), a read only memory (ROM), magnetic memory, flash memory, magnetic or optical disk. 电力组件906为装置900的各种组件提供电力。  Power assembly 906 of apparatus 900 provides power to the various components. 电力组件906可以包括电源管理系统，一个或多个电源，及其他与为装置900生成、管理和分配电力相关联的组件。 Power assembly 906 may include a power management system, one or more power sources, and the other is generating apparatus 900, the management and distribution of power associated components. 多媒体组件908包括在所述装置900和用户之间的提供一个输出接口的屏幕。  Display assembly 908 includes means 900 provided between the screen and a user interface output. 在一些实施例中，屏幕可以包括液晶显示器（LCD)和触摸面板（TP)。 In some embodiments, the screen may include a liquid crystal display (LCD) and a touch panel (TP). 如果屏幕包括触摸面板， 屏幕可以被实现为触摸屏，以接收来自用户的输入信号。 If the screen includes a touch panel, the screen may be implemented as a touch screen to receive an input signal from a user. 触摸面板包括一个或多个触摸传感器以感测触摸、滑动和触摸面板上的手势。 The touch panel includes one or more touch sensors to sense touch, a gesture on the touch panel and sliding. 所述触摸传感器可以不仅感测触摸或滑动动作的边界，而且还检测与所述触摸或滑动操作相关的持续时间和压力。 The touch sensor may sense not only a touch or sliding motion of the boundary, but also detecting the touch or sliding correlation operation duration and pressure. 在一些实施例中，多媒体组件908包括一个前置摄像头和/或后置摄像头。 In some embodiments, the multimedia component 908 includes a front camera and / or the rear camera. 当设备900处于操作模式，如拍摄模式或视频模式时，前置摄像头和/或后置摄像头可以接收外部的多媒体数据。 When the device 900 is in operation mode, such as the shooting mode or video mode, front camera and / or the rear camera may receive an external multimedia data. 每个前置摄像头和后置摄像头可以是一个固定的光学透镜系统或具有焦距和光学变焦能力。 Each of the front camera and the rear camera may be a fixed optical system or a lens having a focal length and optical zoom capability. 音频组件910被配置为输出和/或输入音频信号。  Audio component 910 is configured to output and / or input audio signal. 例如，音频组件910包括一个麦克风（MIC)，当装置900处于操作模式，如呼叫模式、记录模式和语音识别模式时，麦克风被配置为接收外部音频信号。 For example, an audio component 910 includes a microphone (the MIC), when the device 900 in the operation mode, such as a call mode, recording mode and voice recognition mode, the microphone configured to receive an external audio signal. 所接收的音频信号可以被进一步存储在存储器904或经由通信组件916发送。 The received audio signal may be transmitted further or stored in the memory 904 via the communications component 916. 在一些实施例中，音频组件910还包括一个扬声器，用于输出音频信号。 In some embodiments, an audio component 910 further includes a speaker for outputting an audio signal. I/0接口912为处理组件902和外围接口模块之间提供接口，上述外围接口模块可以是键盘，点击轮，按钮等。  I / 0 interface 912 provides an interface between the processing component 902 and a peripheral interface module, said peripheral interface module may be a keyboard, click wheels, and so the button is. 这些按钮可包括但不限于：主页按钮、音量按钮、启动按钮和锁定按钮。 These buttons may include, but are not limited to: home button, volume button, start button and the lock button. 传感器组件914包括一个或多个传感器，用于为装置900提供各个方面的状态评估。  The sensor assembly 914 includes one or more sensors for providing the status of various aspects of the evaluation device 900. 例如，传感器组件914可以检测到设备900的打开/关闭状态，组件的相对定位，例如所述组件为装置900的显示器和小键盘，传感器组件914还可以检测装置900或装置900 一个组件的位置改变，用户与装置900接触的存在或不存在，装置900方位或加速/减速和装置900的温度变化。 For example, the sensor assembly 914 to the device 900 may detect an open / closed state, the relative positioning of the components, for example, the assembly 900 is a display apparatus and a keypad, the sensor assembly 914 may also be a component of the position change means 900 or means 900 detects , absence of user contact with the device 900 or not present, the device 900 orientation or acceleration / deceleration means and temperature change of 900. 传感器组件914可以包括接近传感器，被配置用来在没有任何的物理接触时检测附近物体的存在。 The sensor assembly 914 may include a proximity sensor, configured to in the absence of any physical contact detecting nearby objects. 传感器组件914还可以包括光传感器，如CMOS或C⑶图像传感器，用于在成像应用中使用。 The sensor assembly 914 may further include a light sensor, such as a CMOS image sensor or C⑶, for use in imaging applications. 在一些实施例中，该传感器组件914还可以包括加速度传感器，陀螺仪传感器，磁传感器，压力传感器或温度传感器。 In some embodiments, the sensor assembly 914 may further include an acceleration sensor, a gyro sensor, a magnetic sensor, a pressure sensor or a temperature sensor. 通信组件916被配置为便于装置900和其他设备之间有线或无线方式的通信。  Communication component 916 is configured for communication between device 900 and other devices facilitate wired or wireless manner. 装置900可以接入基于通信标准的无线网络，如WiFi，2G或3G，或它们的组合。 Device 900 may access the wireless network-based communications standards, such as WiFi, 2G or 3G, or combinations thereof. 在一个示例性实施例中，通信部件916经由广播信道接收来自外部广播管理系统的广播信号或广播相关信息。 In one exemplary embodiment, the communication section 916 receives a broadcast signal or broadcast associated information from an external broadcast management system via a broadcast channel. 在一个示例性实施例中，所述通信部件916还包括近场通信（NFC)模块，以促进短程通信。 In one exemplary embodiment, the communication member 916 further includes a near field communication (NFC) module to facilitate short-range communications. 例如，在NFC模块可基于射频识别（RFID)技术，红外数据协会（IrDA)技术，超宽带(UWB)技术，蓝牙（BT)技术和其他技术来实现。 For example, the NFC module can be based on radio frequency identification (RFID) technology, infrared data association (IrDA), ultra wideband (UWB) technology, Bluetooth (BT) technology and other technologies. 在示例性实施例中，装置900可以被一个或多个应用专用集成电路（ASIC)、数字信号处理器（DSP)、数字信号处理设备（DSPD)、可编程逻辑器件（PLD)、现场可编程门阵列(FPGA)、控制器、微控制器、微处理器或其他电子元件实现，用于执行上述方法。  In an exemplary embodiment, the apparatus 900 may be substituted with one or more application specific integrated circuits (ASIC), a digital signal processor (DSP), digital signal processing devices (DSPDs), programmable logic devices (PLD), a field programmable gate array (the FPGA), a controller, a microcontroller, a microprocessor, or other electronic components to achieve, for performing the above method. 在示例性实施例中，还提供了一种包括指令的非临时性计算机可读存储介质，例如包括指令的存储器904,上述指令可由装置900的处理器920执行以完成上述方法。  In an exemplary embodiment, further comprising instructions provided a non-transitory computer-readable storage medium such as a memory 904 comprising instructions, the command executed by the processor 920 means 900 to the above methods. 例如，所述非临时性计算机可读存储介质可以是R0M、随机存取存储器（RAM)、CD-ROM、磁带、 软盘和光数据存储设备等。 For example, the non-transitory computer-readable storage medium may be a R0M, a random access memory (RAM), CD-ROM, magnetic tapes, floppy disks, and optical data storage devices. 本领域技术人员在考虑说明书及实践这里公开的公开后，将容易想到本公开的其它实施方案。  Those skilled in the art upon consideration of the specification and practice of the disclosure disclosed herein, will readily appreciate other embodiments of the present disclosure. 本申请旨在涵盖本公开的任何变型、用途或者适应性变化，这些变型、用途或者适应性变化遵循本公开的一般性原理并包括本公开未公开的本技术领域中的公知常识或惯用技术手段。 This application is intended to cover any variations, uses, or adaptations of the present disclosure, these variations, uses, or adaptations following the general principles of the present disclosure and include the common general knowledge in the art of the present disclosure is not disclosed in the conventional techniques or . 说明书和实施例仅被视为示例性的，本公开的真正范围和精神由下面的权利要求指出。 The specification and examples be considered as exemplary only, the true scope and spirit of the present disclosure being indicated by the following claims. 应当理解的是，本公开并不局限于上面已经描述并在附图中示出的精确结构，并且可以在不脱离其范围进行各种修改和改变。  It should be understood that the present disclosure is not limited to the above has been described and illustrated in the drawings precise structure, and may be departing from its scope various modifications and changes do not. 本公开的范围仅由所附的权利要求来限制。 The scope of the present disclosure is limited only by the appended claims. 1. 一种手机温度的调整方法，其特征在于，所述方法包括： 当温度获取条件被触发时，获取手机的当前环境温度； 根据所述当前环境温度和预存的环境温度与温度控制策略的对应关系，确定与所述当前环境温度对应的温度控制策略； 根据确定的所述温度控制策略调整所述手机的温度。 CLAIMS 1. A method for adjusting the temperature of the mobile phone, wherein, said method comprising: acquiring, when the temperature condition is triggered, the mobile phone acquires the current ambient temperature; control strategy according to the current ambient temperature and the stored temperature and ambient temperature the corresponding relationship, determine the current temperature corresponding to the ambient temperature control strategy; control strategy to adjust the temperature of the mobile phone according to the determined temperature. 2. 根据权利要求1所述的手机温度的调整方法，其特征在于，所述温度获取条件被触发，包括： 获取当前时间，若当前时间达到预设的温度获取时间，则所述温度获取条件被触发；或者获取所述手机的当前位置和移动前的位置，若二者之间的距离大于预设距离，则所述温度获取条件被触发。 The method of adjusting the temperature of the mobile phone as claimed in claim, wherein said temperature condition is triggered acquisition, comprising: obtaining current time if the current time reaches the preset temperature acquisition time, the temperature condition acquisition it is triggered; or acquiring the location before the current position of the mobile handset and, if the distance between the two greater than a preset distance, said temperature condition is triggered acquisition. 3. 根据权利要求1所述的手机温度的调整方法，其特征在于，所述获取手机的当前环境温度，包括： 从内置的天气应用程序获取所述当前环境温度；或者从天气服务器提供的天气应用程序编程API接口获取所述当前环境温度。 The method of adjusting the temperature of the mobile phone as claimed in claim, wherein the obtaining the current ambient temperature of the mobile phone, comprising: obtaining the current ambient temperature from the built-in weather application; or from a weather server providing the weather API application programming Interface acquires the current ambient temperature. 4. 根据权利要求1所述的手机温度的调整方法，其特征在于，所述环境温度与温度控制策略的对应关系保存在所述手机的固件包ROM中。 The method of adjusting the temperature of the mobile phone as claimed in claim, wherein said corresponding relationship between the ambient temperature and temperature control strategy stored in the ROM firmware package in the mobile phone. 5. 根据权利要求1所述的手机温度的调整方法，其特征在于，所述方法还包括： 在所述根据所述当前环境温度和预存的环境温度与温度控制策略的对应关系之前，显示提示信息，以提示用户通过下载所述环境温度与温度控制策略的对应关系来调整手机温度； 从所述手机的服务器获取并保存所述环境温度与温度控制策略的对应关系。 The method of adjusting the temperature of the mobile phone as claimed in claim, wherein said method further comprises: a correspondence relationship in the control strategy according to the current ambient temperature and the ambient temperature and pre-stored temperature before a prompt is displayed information to prompt the user to adjust the temperature by mobile phone to download the corresponding relationship between ambient temperature and the temperature control strategy; obtain from the phone's server and stored on the ambient temperature and the temperature control corresponding relationship strategy. 6. 根据权利要求5所述的手机温度的调整方法，其特征在于，所述提示信息中包含所述环境温度与温度控制策略的对应关系的下载入口。 6. The method of adjusting the temperature of the mobile phone according to claim, wherein said inlet prompted to download information includes a correspondence between the ambient temperature and temperature control strategy. 7. 根据权利要求1所述的手机温度的调整方法，其特征在于，所述根据确定的温度控制策略调整所述手机的温度，包括： 根据确定的温度控制策略控制中央处理单元CPU工作，以调整所述手机的温度；或者根据确定的温度控制策略控制运行的应用程序数量，以调整所述手机的温度。 The method of adjusting the temperature of the mobile phone of claim, wherein the control strategy adjustment of the temperature of the mobile phone according to a determined temperature, comprising: a control strategy central processing unit CPU operates according to the determined temperature to adjusting the temperature of the mobile phone; or the number of applications running policy control according to the determined control temperature to adjust the temperature of the cell phone. 8. -种手机温度的调整装置，其特征在于，所述装置包括： 触发获取模块，被配置为当温度获取条件被触发时，获取手机的当前环境温度； 确定模块，被配置为根据所述触发获取模块获取的所述当前环境温度和预存的环境温度与温度控制策略的对应关系，确定与所述当前环境温度对应的温度控制策略； 控制模块，被配置为根据所述确定模块确定的温度控制策略调整所述手机的温度。 8. - temperature adjustment device of handsets, characterized in that, said means comprising: obtaining a trigger module configured to obtain the time when the temperature condition is triggered, the mobile phone acquires the current ambient temperature; determining module, configured in accordance with the a correspondence relationship obtaining module triggering the current ambient temperature and the ambient temperature and the temperature of the pre-stored control strategy to determine the current temperature corresponding to the ambient temperature control strategy; a control module configured to determine based on the temperature determination module adjusting the temperature control of the mobile phone strategy. 9. 根据权利要求8所述的手机温度的调整装置，其特征在于，所述触发获取模块包括： 第一触发子模块，被配置为获取当前时间，若当前时间达到预设的温度获取时间，则所述温度获取条件被触发；或者第二触发子模块，被配置为获取所述手机的当前位置和移动前的位置，若二者之间的距离大于预设距离，则所述温度获取条件被触发。 9. The mobile phone according to the temperature adjustment apparatus according to claim 8, wherein said trigger acquisition module comprises: a first trigger sub-module, configured to obtain the current time, if the current time reaches the preset temperature acquisition time, then the temperature condition is triggered acquisition; or the second trigger sub-module, configured to acquire the current position and the position before the mobile handset, when a distance between the two greater than a preset distance, the temperature acquisition condition It is triggered. 10. 根据权利要求8所述的手机温度的调整装置，其特征在于，所述触发获取模块包括： 第一获取子模块，被配置为从内置的天气应用程序获取所述当前环境温度；或者第二获取子模块，被配置为从天气服务器提供的天气应用程序编程API接口获取所述当前环境温度。 10. The mobile phone according to the temperature adjustment apparatus according to claim 8, wherein said trigger acquisition module comprises: a first obtaining sub-module, configured to acquire the current ambient temperature from the built-in weather application; or the first two acquisition sub-module, configured to provide a weather application programming API interface to obtain from a weather server the current ambient temperature. 11. 根据权利要求8所述的手机温度的调整装置，其特征在于，所述环境温度与温度控制策略的对应关系保存在所述手机的固件包ROM中。 11. The mobile phone according to the temperature adjustment apparatus according to claim 8, wherein the ambient temperature corresponding to the temperature relationship of the control strategy stored in the ROM firmware package phone. 12. 根据权利要求8所述的手机温度的调整装置，其特征在于，所述装置还包括： 显示模块，被配置为在所述确定模块根据所述当前环境温度和预存的环境温度与温度控制策略的对应关系之前，显示提示信息，以提示用户通过下载所述环境温度与温度控制策略的对应关系来调整手机温度； 对应关系获取模块，被配置为从所述手机的服务器获取并保存所述环境温度与温度控制策略的对应关系。 12. The mobile phone according to the temperature adjustment apparatus according to claim 8, characterized in that said apparatus further comprises: a display module configured to determine the ambient temperature of the module according to the current ambient temperature and the stored temperature control before the corresponding relationship between policy, display a message to prompt the user to adjust the temperature of the phone by downloading the corresponding relationship between the ambient temperature and temperature control strategy; correspondence relationship obtaining module, configured to acquire from the server and saves the phone ambient temperature and temperature control correspondence between the strategy. 13. 根据权利要求12所述的手机温度的调整装置，其特征在于，所述提示信息中包含所述环境温度与温度控制策略的对应关系的下载入口。 13. The temperature adjusting means phone as claimed in claim 12, wherein said inlet prompted to download information includes a correspondence between the ambient temperature and temperature control strategy. 14. 根据权利要求8所述的手机温度的调整装置，其特征在于，所述控制模块包括： 第一控制子模块，被配置为根据确定的温度控制策略控制中央处理单元CPU工作，以调整所述手机的温度；或者第二控制子模块，被配置为根据确定的温度控制策略控制运行的应用程序数量，以调整所述手机的温度。 14. A mobile phone according to the temperature adjustment apparatus according to claim 8, wherein said control module comprises: a first control sub-module, configured to control the central processing unit CPU is a control strategy based on the determined working temperature, in order to adjust the the temperature of said mobile phone; or a second control sub-module, configured to control the number of application control policies according to the determined operating temperature to adjust the temperature of the cell phone. 15. -种手机温度的调整装置，其特征在于，包括： 处理器； 用于存储处理器可执行指令的存储器； 其中，所述处理器被配置为： 当温度获取条件被触发时，获取手机的当前环境温度； 根据所述当前环境温度和预存的环境温度与温度控制策略的对应关系，确定与所述当前环境温度对应的温度控制策略； 根据确定的温度控制策略调整所述手机的温度。 15. - temperature adjustment device of handsets, characterized in that, comprising: a processor; processor-executable instructions for storing a memory; wherein the processor is configured to: when the temperature condition is triggered acquisition, acquisition phone the current ambient temperature; the corresponding relationship between the current ambient temperature and the ambient temperature and the temperature of the pre-stored control strategy to determine the current temperature corresponding to the ambient temperature control strategy; control adjustment policy of the mobile phone according to the determined temperature of the temperature.